Elephants are incredible animals, they create grasslands, germinate trees, build seasonal waterholes and they help other species survive during the dry season. These are just a few of the amazing ways they impact our landscape. My Name Is Katie Rowe, I live in Northern Kenya, in a remote and untouched wilderness called the Mathews Range. I have been drawn here by my love for pristine wilderness, wildlife and working with traditional communities. In the last eight years I have been privileged to have been able to partner with the Samburu who own the land, evolving ideas and developing projects which are entirely community owned and run. It is hard not to be inspired by these people and this land as it is one of the last remaining landscapes where humans and wildlife co exist, for hundreds of years the Samburu have shared water and grasslands in harmony with their wildlife. However due to recent population increase, human wildlife conflict, the illegal wildlife trade and global warming are all taking their toll and the ability for people and wildlife to thrive together has become strained. For the Samburu, cattle, grass and water is their life blood, but sadly the modern reality is living in a landscape where over grazing, erosion and intolerance for wildlife have become common, as people and wildlife are forced in to smaller spaces looking for pasture. The idea for the Reteti elephants sanctuary was sewn in 2011, the rise in poaching was rapid and a harsh drought meant animals were dyeing, as well as falling in to deep wells dug by the community. The more animals that fell in, died and contaminated their precious water supply the more intolerant they were becoming. We felt we were on borrowed time and a solution in terms of saving a key stone species and at the same time creating employment needed to be made. It took us three years to get the permission from the Kenya Wildlife service, gain the trust and blessing from the community and to cultivate donor support. Although frustrating, within these few years of waiting we perfected the skills of rescuing and re uniting elephant calfs with their mothers. We realised that when they had fallen in to a well that their mother was driven away by herders coming to use the same water. This set us apart from all the rest, who told us continuously that it was not possible as it had never been done before. 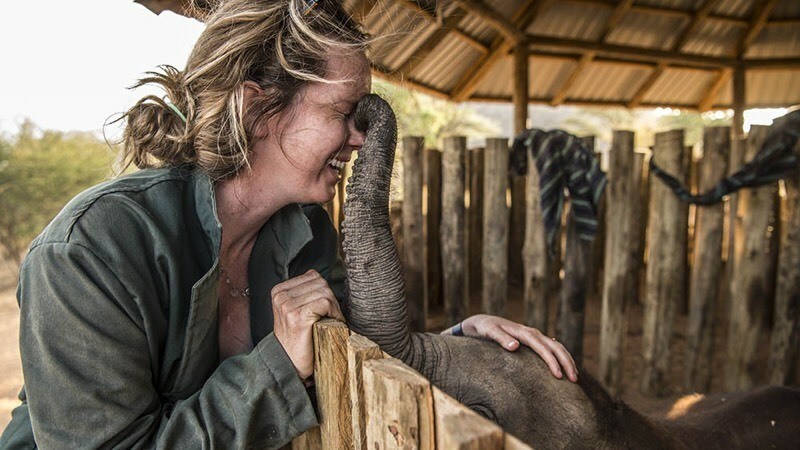 The Reteti elephant sanctuary offers employment where there has been none. Working along side and taking ownership and pride in their wildlife which is now generating income that reaches out to 150 people and their families. This in its self has been an incredibly effective form of conservation. Seeing how in just a few steps the mindset has changed from an animal they hated and feared to now being protective and proud for being the first community to hand raise vulnerable orphans has been humbling. It has also been a dream to be able to encourage women, traditionally not welcomed in job positions to be involved and work equally alongside men. Being young I was scared and nervous. But the community was my support and protecting wildlife for the next generation was my drive. The idea that wildlife and communities living together may stand a chance was worth a gamble. We started to become renowned for our ability to successfully raise orphaned animals and different species, some under great threat were sent our way to be reared and one day re released. For example the very endangered grevy zebra ( only 250 left in this area and 1250 in total ) black rhino as well as many others. Our ideas of keeping the animals as wild as possible with limited human contact ( other than with their keepers ) as well as the animal being able to remain within its home range rather than being taken hundreds of kilometres away to an unfamiliar terrain insures the greatest possibility of re wilding, and possibly even meeting up with their own families is what makes Reteti really special. The project has become a platform for community education on protecting their wildlife and environment. The scope for this project to grow and become a flagship for the whole mountain range ( millions of acres ) and provide employment and empowering the community is vast. As well as the unique opportunity to further our research on these iconic species, re wilding orphans within a landscape from which their families still roam has never been done before. Its hard not to be excited about what we will learn about these incredibly intelligent animals. Thank you for this opportunity to share our story. We would like to carry on and share the belief with the world that humans and wild life can share a landscape peacefully once again, in the hopes the idea might spread!